Large amounts of precipitation on a near daily basis is enough to cause flooding in many regions of the United States. 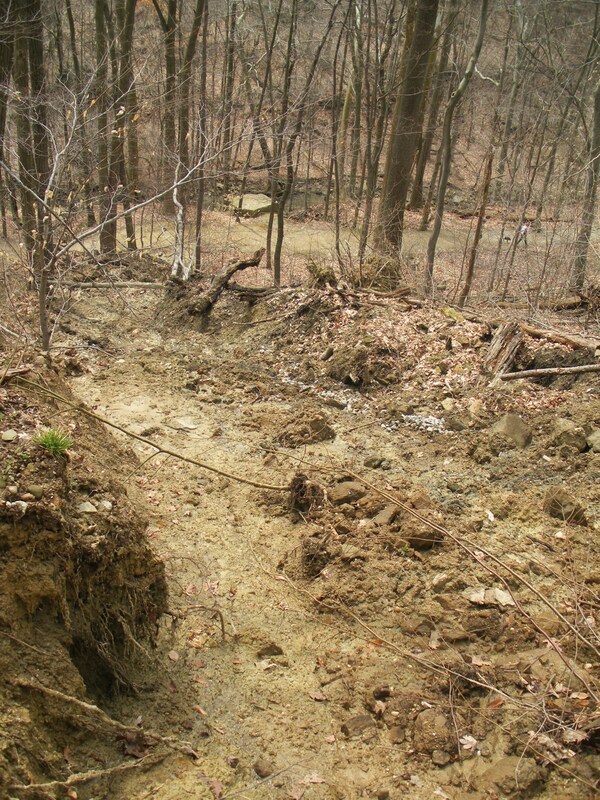 One additional hazard that is often overlooked in areas of the country such as NE Ohio is slope stability. When water seeps into the ground, it does so by travelling through the pore spaces in between the soil particles. If those pore spaces become filled with water, the soil comprising the slope becomes saturated and unstable. Pore water exerts pressure on the surrounding soil particles, forcing them apart enough to cause this instability. If enough water is added, the slope will become too unstable to support itself and begin to fail, moving downhill under the force of gravity. Water, in fact, is one of the main causes of most slope failures: landslides, mud-flows, rock falls, or any other type of mass wasting. The devastating rockslide which occurred along Interstate 40 on the Tennessee border in October 2009, for example, happened after two days of rain. These issues could happen if enough water is supplied during a single torrential rain storm or over time with a steady supply of water, as was the case this spring in NE Ohio. Why, then, is a hazard such as this not deemed very important in some locations? Simply because the likelihood of a slope failure even approaching a significant risk is very low. In its geologic past, NE Ohio served as a shallow sea bed leaving behind horizontal layers of sedimentary rock. In the millions of years since, there has been no significant orogenic forces to uplift, fold, and crumple the rock layers into mountains and valleys. Instead, the bedrock lays with a gentle slope (only about a 20-foot vertical drop over a mile) and, to boot, has been “bulldozed” by glaciers, leaving little topography other than gentle, rolling hills. However, rivers tend to downcut through the glacial sediments and horizontal rock strata to create steep slopes along the valley walls – prime landslide real estate. The debris flow cut out approximately 15 feet of trail. The head scarp is visible on the right. The Gorge Metropolitan Park in Akron, Ohio is located along the Cuyahoga River and was my destination in early April. A dirt hiking trail leaves the parking lot and parallels the river, splitting into an upper and lower trail – two halves of a long, narrow loop. 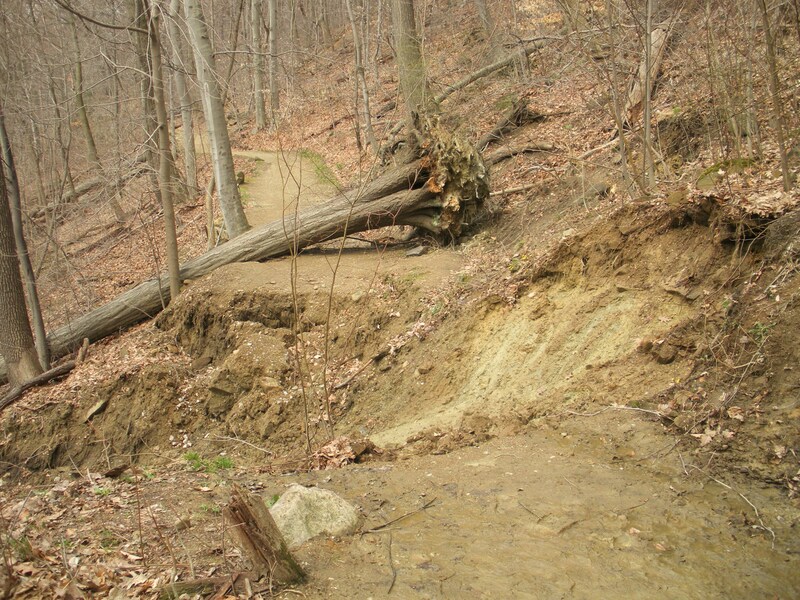 Shortly after this fork in the trail is the location of the first landslide of springtime. Well, at least the first outwardly noticeable landslide in a public area near to where I live…that I knew of. 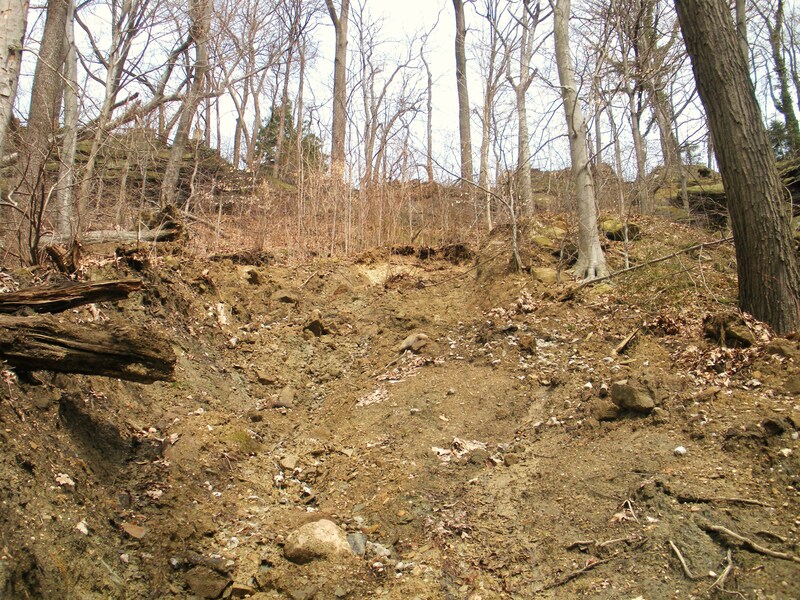 The head scarp of the slide originated just above the upper trail, with the slide moving about 120 feet downslope to the lower trail. Looking down the debris flow to the lower trail. If you look closely, you can see people walking on the trail for some sense of scale. The slide was bound to happen. In this location, most of the soil is made up of weathered material from the Sharon Sandstone formation, making up most of the valley walls. Composed primarily of fine to coarse sand and gravel, with plenty of larger cobbles, the soil here (like the rock from which it came) is very permeable. The rain and snow melt was able to easily saturate the slope and cause it to fail. 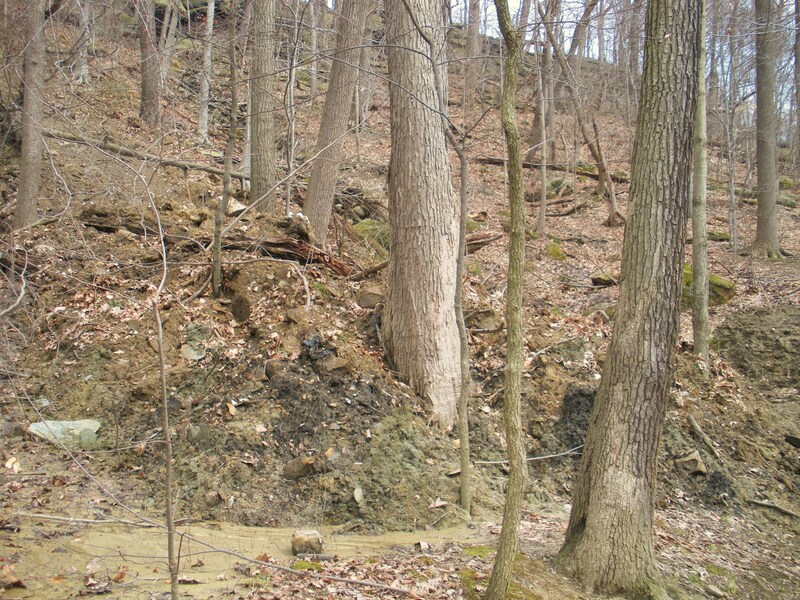 This slope failure in particular is considered a debris flow due to the coarse material, the nature with which it moved downslope (much like wet concrete), and the debris that was mixed into the moving material (the trees and plants that got caught in its path). Looking upslope from the midway point. I happened to be visiting during the afternoon two days after the slide occurred and a day after it had last rained, yet the soil in the immediate vicinity was still completely saturated. 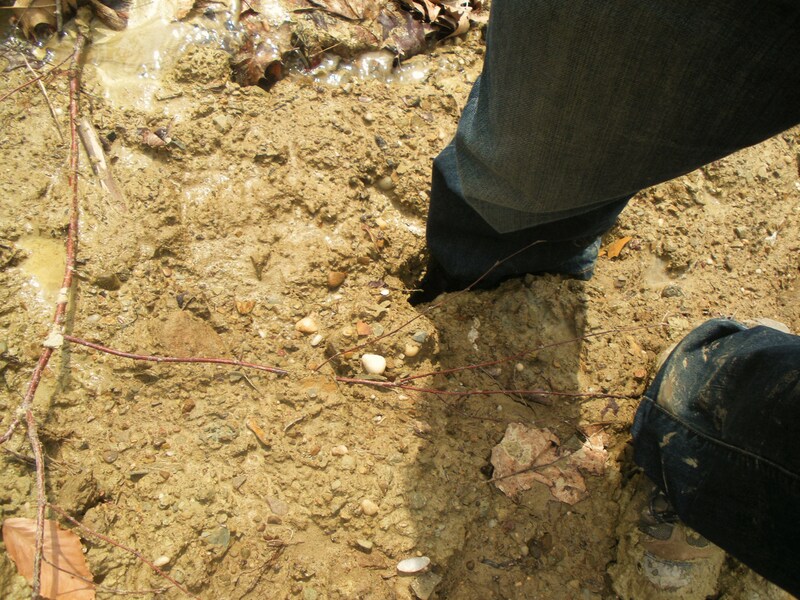 Water continued to flow out of the ground near the head of the failure, exemplifying how much water must have been present in the ground at the time of failure. At its base, the debris flow has wrapped around trees. Realizing just how saturated the ground is, still two days after the landslide occurred. While slope failures may not be a big issue in NE Ohio (indeed this one posed little threat), in many hilly and mountainous areas they can be a major concern. In those regions, slope stability is taken very seriously. Experts, such as engineering geologists, are hired to assess potential stability issues and help to mitigate them.